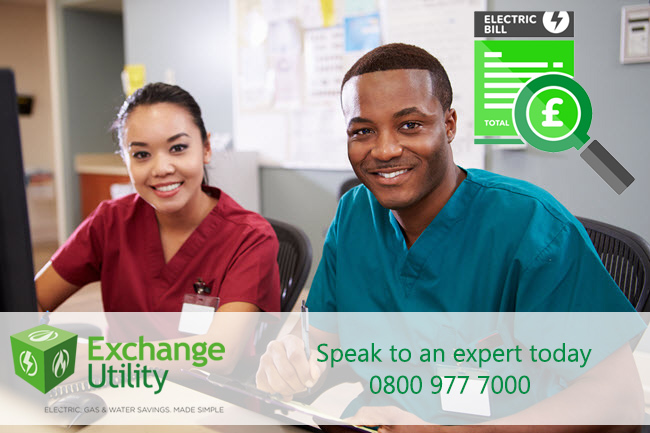 By comparing and switching business gas and electricity supplier with Exchange Utility, you could save up to 36%* on your business’s energy bills! In recent years, the UK’s ageing population has resulted in an ever greater need for care home places, nursing home places and residential services to support the demands of our advancing generation. With Social Care facing an estimated shortfall of around £2.5bn by 2020, we all need to face up to the fact that cuts will need to be made, or finances found from somewhere, which often means other services going without in order to meet the shortfall. The elderly are also becoming increasingly dissatisfied with their standard of living and it’s no wonder… With over 2.9million +65 year olds saying that they feel that they have no one to turn to for help and support and only as little as 36% of people aged 50 and over saying that they are confident that older people who receive care services are treated with dignity and respect. Amongst other reasons for funding shortfalls in care services, like higher staffing costs, local authority budget cuts regarding how much they pay towards patient care takes a prominent position of blame in failing standards. In 2015, 15 social care and elderly support groups addressed this issue with George Osbourne, writing to him in a plea to address the £2.5billion funding gap that the sector faces in the coming years. So clearly, with budgets being stretched, anything that can be done needs to be done to help stretch the already overly stretched budgets. What Can Your Care or Nursing Home do to Bridge the Funding Gap? There are options available to your care home and nursing home, which will not impose on the quality of living of your residents, the working conditions of staff or your ability to run your business. Our experience dictates that energy saving in care homes and nursing homes is a strong and successful overhead reduction tactic. You can incorporate it into pretty much every aspect of your business to reduce both costs and your environmental impact – which in turn could make your business the care home or nursing home of choice to environmentally conscious residents. 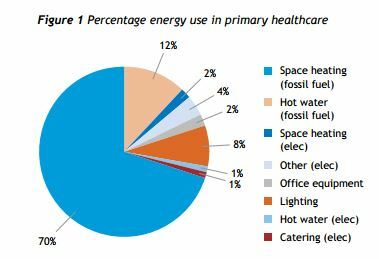 In the pie chart image (right), you can see the typical energy usage distribution for primary healthcare services. 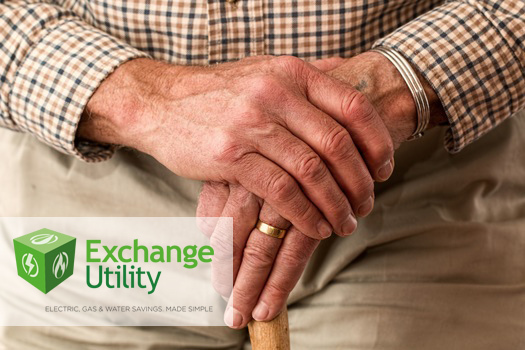 Exchange Utility’s team of energy experts have explored the energy saving possibilities that are open to care homes and nursing homes and conjured a list of pathways that have the potential to save your business thousands of pounds collectively. This is funding that you would then be free to reinvest in training, facilities and the overall well-being of your business. The Competition Markets Authority estimates that over 1.3 million businesses are overpaying on their energy contracts, resulting in suppliers accumulating approximately £500 million each year in EXCESS profits! This can be due to a number of reasons, including selecting inappropriate tariffs for your business’ needs or allowing your business to go out of contract – which results in you being placed onto more costly tariffs. To combat this, and potentially save up to 36% on your business energy spend, all you need do is contact a member of staff at Exchange Utility on 0800 9777 000 for a completely free and impartial tariff review. 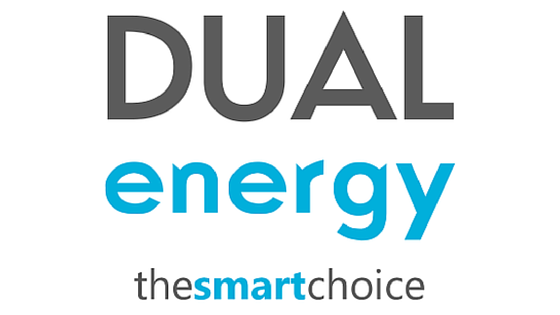 Our experts are specifically trained in the best ways to manage business energy and how to select the best contract for your business – Utilising their knowledge for your business can result in you making an easy saving without having to lift a finger! All you need is a recent bill and our experts will guide you through the rest. Get in touch on 0800 9777 000 or complete our online enquiry form above to start saving today. As you can see, heating is a major culprit for care homes and nursing homes experiencing high energy bills, concerning consumption, as it is typically responsible for 70% of the cost of energy bills. Doing this can reduce the number of greenhouse gases that your heating system emits by half and running costs by as much as two thirds. As we get older, we naturally feel the cold more. But by ensuring the rooms as well insulated, it may be possible to warm the rooms, whilst at the same time reducing the temperature of your heating, even by just one degree can save your business £85-£90 each year in a property the size of a three bedroom semi-detached according to the Energy Saving Trust – Imagine the difference it could make to your care home or nursing home. Leaving a window open overnight wastes the same amount of fuel in heating as a small car driving 35 miles! Windows are often opened to regulate the heat within buildings when it gets too warm, so ensuring the heating is set to the ideal temperature will limit the temptation of many residents to open windows if they get too warm. A lack of well-maintained cavity wall and roof insulation can result in your business losing as much as ¼ of its heat. 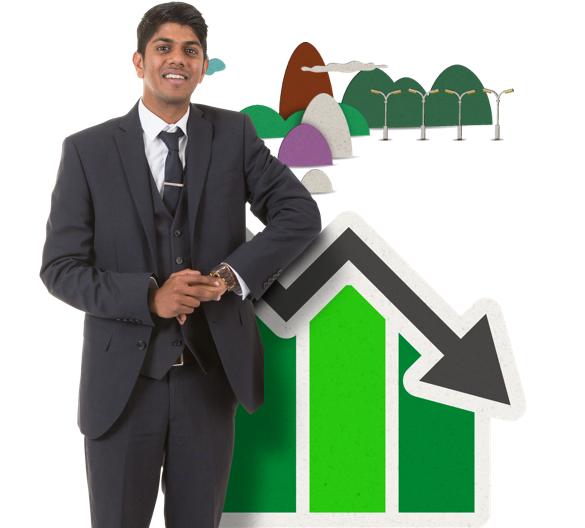 Ensuring insulation is present and topped up regularly could save your business in the region of £135 each year. Here are some simple steps that can help you to achieve all of the above! A single dripping tap is estimated to waste over 5,500 litres of water every year! According to waterwise.org.uk, this is enough water to fill a paddling pool every week for the whole summer. As a result, mending a dripping tap could save your care/nursing home more than £18 per year, PER TAP! 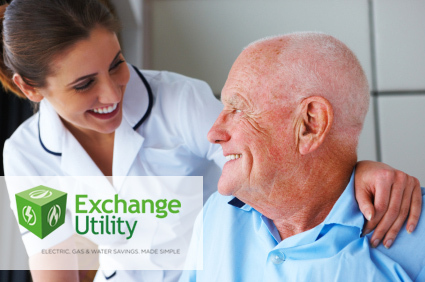 Encouraging just four residents of your care or nursing home – that are able to – to replace just one bath each week with a five-minute shower could save you up to £20 each year on gas and up to £25 on water according to The Energy Saving Trust. So if your care home or nursing home still have facilities for your residents to have baths, as well as showers. Now may be the ideal time to attempt to try and limit the number of residents still using the bath, rather than switching their routine for showers. It might come as a surprise to you that shower heads can also have a large impact on your care homes water consumption and bills. This is because some shower heads are able to use the water that they protrude more efficiently than others. Swapping an inefficient shower head for an efficient one has the potential to save your business approximately £65 on gas bills and £100 on water bills each year! Turn the Lights Out on Poor Efficiency! Installing motion sensors is a highly effective way of ensuring that you aren’t wasting money on unnecessary lighting without having to goad people about turning lights off. Sensors can cost as little as £20 and save your business up to 10% on lighting spend. Although not often applied to the care home sector, installing smart key cards that cut the power to lighting and other none essential devices when a resident exits their room – like in hotels – has HUGE saving potential! There are hotels who have used this method to take control of their energy spend that have managed to save 45% on their lighting bill – That is an impressive piece of consumption reduction! Plus your care home would reap the added benefits of giving residents a fond reminder of being on holiday as well as ease of entry into their room or residence and inexpensive key replacements. It is no longer a secret that certain types of bulb use less energy than others. The question is, to what extent are the potential savings? As you can see, care homes and nursing homes have the potential to save a lot of money using clever consumption reduction techniques and appropriate energy management advice. 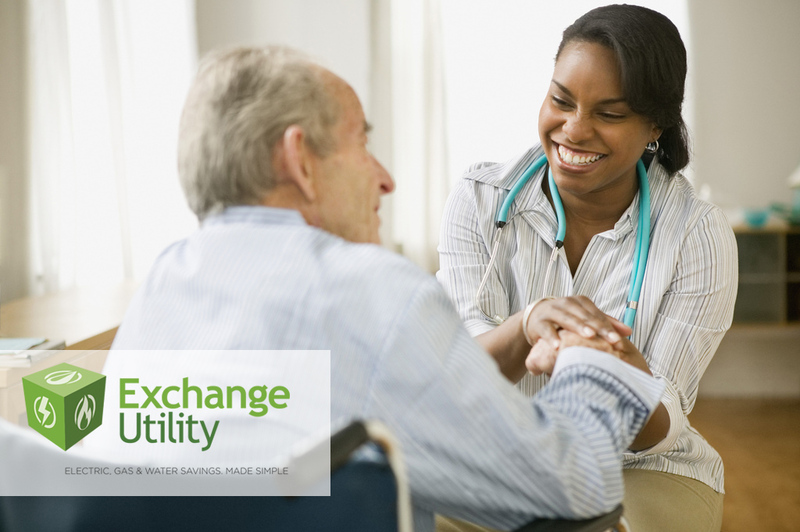 If you’re looking for a FREE and easy way to get started, find a recent bill and call an Exchange Utility business energy expert. They will be able to aid you in recognising if you are overpaying your current suppliers and advise on appropriate, cost saving, courses of action for your business going forward. It’s quick, simple and can help your care or nursing home to take the first step in taking control of its energy costs and consumption. 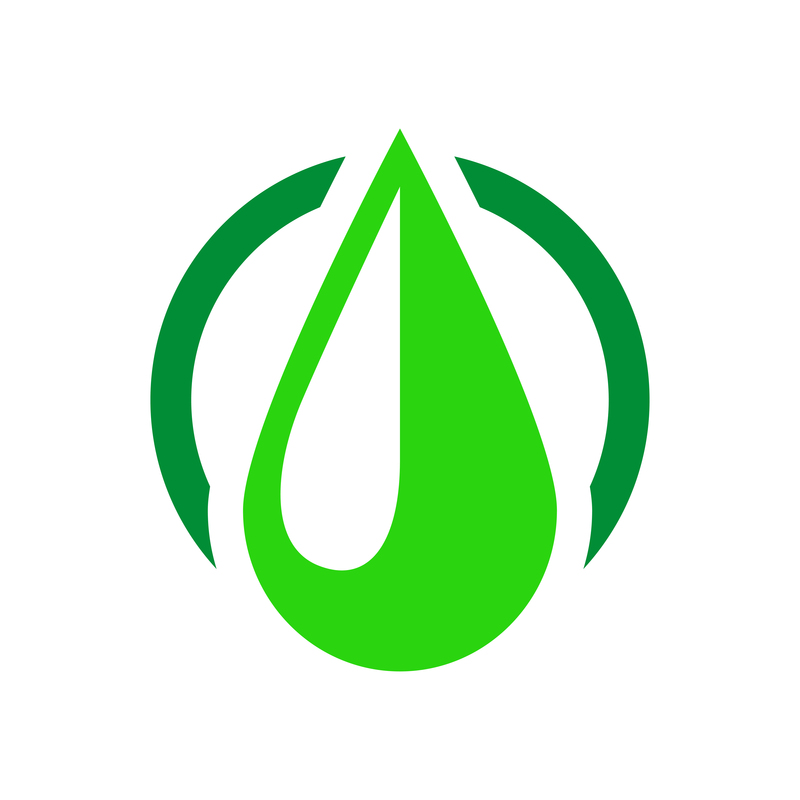 If you’re looking for helpful energy saving tips for businesses operating within other industries, you can find more helpful tips and advice on our business energy saving advice page.